Health & Safety is the single most important factor in every contract, large or small. Storm Industrial Roofing Ltd employs the services of both a fully trained contracts manager and an external advisor to ensure all of our practises are up to date with current legislations, which can change frequently. As the client, you can rest assured that the full and correct Health & Safety equipment will be utilized where practical and possible on every job. Storm Industrial Roofing Ltd complies to all current legal requirements and guidelines provided by the HSE, such as Health and Safety at Work Act 1974, the Construction Design and Management (CDM) regulations of 2015 where necessary and RIDDOR (Reporting of Injuries, Diseases and Dangerous Occurrences) 2013. 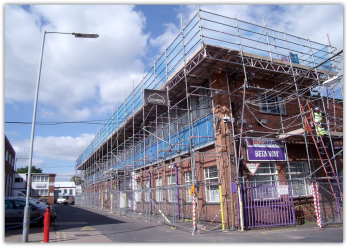 Storm Industrial Roofing Ltd offer careful planning, implementation and supervision on every aspect of a contracts Health & Safety, from Scaffolding and Safety Netting right through to ensuring appropriate PPE is worn on site by our workforce at all times. Company policy is to ensure all our operatives are fully trained and asks that they attend regular Health and Safety refresher training.